Toshiba CB30-102 13" Light Weight Laptop Intel Dual Core 2955U 2GB RAM 16GB SSD. 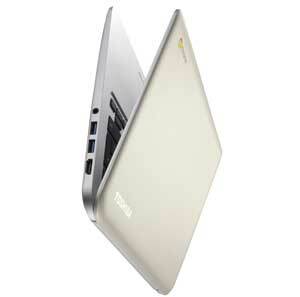 Toshiba CB30 Chromebook is very portable with its sleek and slim design. It is very light in weight so you can easily carry it with you. 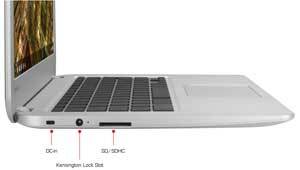 It uses Chrome OS has full connectivity with long battery life which gives you almost 8 hours between the charges. With wi fi and cloud storage you can access internet and store your files on web storage. This chromebook is ideal for working in modern way and it suits everyone from businessmen to students. Toshiba chromebook offers you to store your data on web by giving you 100GB space. With wi fi and built in Google drive your data becomes more accessible. You can store your files locally so you can access them even without a wi fi network. With Toshiba CB30 data storage and its transfer has become very easy. By storing your files in cloud you can access them from anywhere with multiple devices. Toshiba CB30 is equipped with all those features which give you most in play and work. With 13.3 HD display you can browse and play on wide space. As it is HD display you get to see bright and vivid colors. It is packed with Intel Celeron processor to give you great performance. Its extra-long battery which runs up to 9 hours give you more time to work without worrying about the charging. With its long lasting battery you can also work freely on the go. 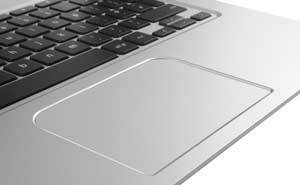 Its sleek and slim design makes it more portable. Its light weight also makes it easier for you to carry it. It weighs only 1.5 kg, which means you can take your work and entertainment everywhere with you just by carrying 1.5Kgs. With its clam shell design it looks stylish and elegant. Its large screen, full sized keyboard, HD webcam and audio makes your work more interesting. In this chromebook you dont have to update your Chrome OS and security software after every few days. Once it is connected it automatically upgrades so you can work without any hurdle. It keeps your laptop completely secured so no virus threats can attack on it. Toshiba CB30 gives you fast speed so now you can quickly download pages and synch your data in fast speed. The device also boots up quickly and comes back to life just in a couple of seconds. All essential connectivity options are available in Toshiba CB30. With 2 USB ports you can easily transfer your data. SD card slot also lets you share your files with other devices by using memory card. HDMI port can also be used to connect your laptop to TV for watching your media on large screen. With integrated HDMI port audio and visual contents are streamed through a single cable. With USB 3.0 you can make your media more portable. It gives you ten times faster speed than USB2.0. Data which took hours to transfer can now be transferred in seconds, thanks to USB3.0. Now you can transfer your heavy files and whole albums just in few seconds. With all these connectivity options data transfer has become very easy and less time consuming. Sharing of files becomes easier with Bluetooth 4.0. Bluetooth lets you share your data to multiple mobile devices. We can transfer data to smartphones, mp3 or mp4 players, etc. Wireless peripherals like headphones, keyboard, mouse and speakers can also be connected by bluethooth.